Workplace technology is changing fast with BYOD, wireless networking, and the work anytime-anywhere mentality of today’s workforce. The ideal conference room should be able to accommodate whatever attendees bring to the table–literally–with minimal compatibility issues and cable-fiddling. Everyone knows time is at a premium so here are several devices and solutions that help you get the most out of your meeting minutes. Visual Appeal: LCD Display or Projector? Companies can spend months waffling over the type of visual display to put in a meeting room. Let’s consider a standard 10-15 person meeting room in the 500-600 square feet range. When considering a business projector, think about the ambient lighting present in the meeting room. The most common complaint you will hear is that the picture is not bright enough. For a sharp presentation in a room with a normal amount of ambient lighting, like if the meeting room has a window with blinds for instance, we recommend a projector with at least 4,000 lumens of brightness. If you check out the business projector store page, you can search by lumens. You will notice that projectors with this level of brightness start at around $1,100. The InFocus IN3126 is a good place to start your projector search. It is competitively priced with basic but useful features, like connectivity over LAN or WLAN, speaker audio output and microphone inputs, and can interface via HDMI, VGA, and USB. 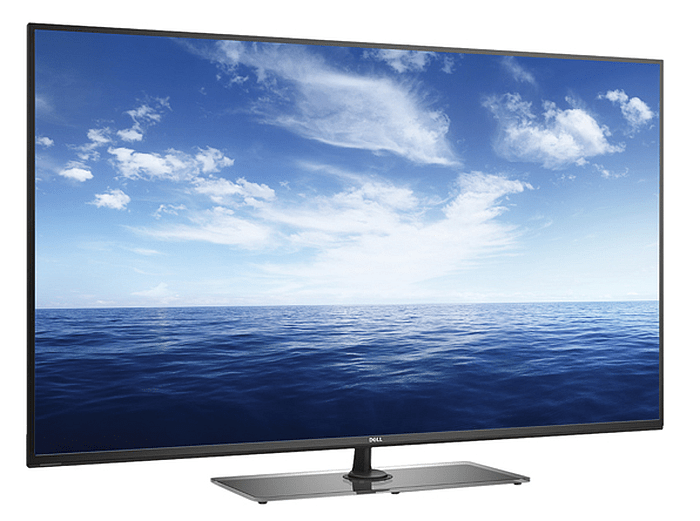 For around the same $1,100 price you can get a 55-inch flat screen LCD display. Keep in mind 55 inches is the smallest screen you should consider for this size of room. Generally, LCD screens are more forgiving with ambient light, so if that is an issue in your meeting room, it is probably enough to sway your decision. Mounting a flat screen to the wall is a relatively straightfoward task, somewhat less labor intensive than hanging a projector from the ceiling. The Dell 55 Series monitor shown above, is built especially for conference rooms. It has automatic resolution support for most laptop resolutions, and HDMI, VGA, and USB inputs. Dell monitors have built-in support for Chrome OS as well. Larger LCD monitors have a bigger price tag (surprise!) and similar compatibility features. As with any tech purchase it is a matter of gauging your specific needs. When is the last time you saw an Ethernet port on a tablet? Most new displays have wireless features built in, but there are tools that can add connectivity to older equipment and bring multi-device collaboration to the next level. 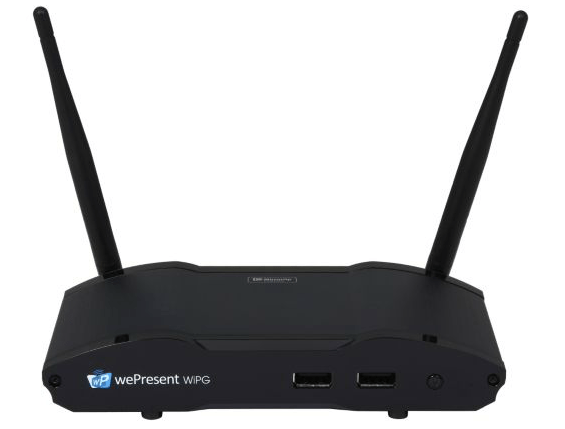 The WePresent Wi-PG 2000 accommodates wireless collaboration for up to 64 users. It offers compatibility for PC, OS, Andoid, and iOS devices, and connects to your LCD flat screen display or projector. It supports Windows 8 touch screen interfaces, and is compatible with any display that gives an HID USB signal. It is a top of the line piece of technology with a top of the line price point of $949. 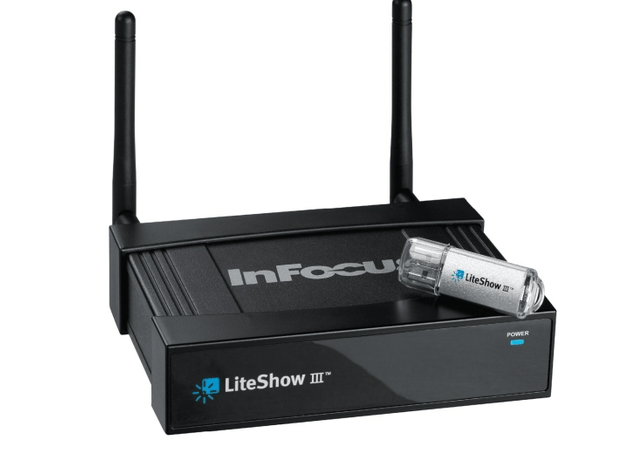 A budget option might be the InFocus LightShow III, shown below. It is supports multi-device collaboration, and is designed for classroom presentation settings. It is designed for Windows 7 and 8 and Mac OS X. NeweggBusiness users report finicky driver behavior when using the more up to date technology, so be mindful. This product might be ideal if you are introducing it to more “legacy” technology environments. If you’re out on the road and a guest in a not-so-hi-tech work location, the IOGear Wireless Mobile and PC to HD GWAVR adapter works great if you need to present in a pinch. It connects your mobile phone, tablet, or laptop to any HDTV or monitor via a wireless. Just plug the, uh, GWAVR into a monitor’s HDMI port, and control your presentation using your device. We would love to know–what new technology are you incorporating into your meeting room design? Meeting room design is ground zero for BYOD technology. Attendees bring the intelligence to the conference room; the conference room provides the interface. At my previous employer we got tired of all the hassle with booking meeting rooms and people stomping into each others meeting, or even worse – started a meeting without checking if the room was already booked by someone else. We felt there should be a way to display those bookings where they are needed – outside each room, but after all the products we found were just way too expensive. Thats when I together with two friends decided to write our own software – and fast-forward two years we’re having a lot of happy customers using our simple Android-based app with full sync to both Exchange/Outlook, Office 365 and Google Calendar. Best of all, the users doesn’t do anything differently or have to learn any new software – it’s completely transparent and hassle-free. Check us out if you like; we’re at http://getmeetio.com and would love for you to try out our app. You can run it on almost any modern Android tablet from the past couple of years.